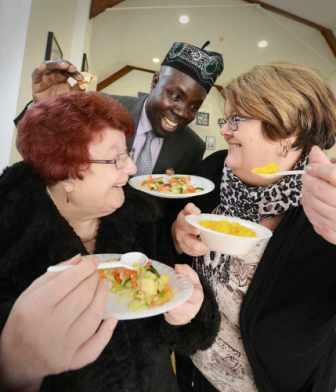 A key figure in the Wolverhampton Muslim community hopes sharing a community meal with people in the area has helped bury misconceptions about people of his faith. The dinner, held at Ahmadiyya Muslim Mosque on Willenhall Road, was organised by Toby Ephram.He is the regional president of the Ahmadiyya Muslim Society, and reckons the slap-up buffet has helped build bridges between different cultures.He said: “It was a great turn out, I must thank god that people from all walks of life, employed, unemployed, black, white, old, young, religious, non-religious came along and enjoyed it.”The place was packed out. He added: “Not everyone has family or people who are there for them.”We wanted to reach out to those people and give them someone to spend time with and talk to.”Everybody should be able to have a nice meal at this time of year, so we put on a special buffet.”We had lots of different food available for everyone, chicken curry, rice – we tried to cater for everybody’s tastes.”People enjoyed it so much they were asking me if we could make it an annual event, so I think that will be our plan. It has been put in the calendar. 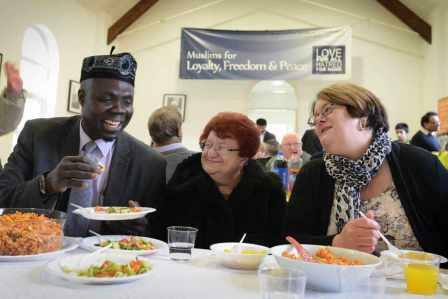 Share the post "Food for thought: Mosque holds community meal to bury misconceptions"